Animal rights is still a radical concept in our culture. I was reminded of this just yesterday while on the train headed to the Animal Rights National Conference. It’s not often that I get to have conversations about animal rights with people of radically different perspectives, but there I was, having breakfast with an Amish farming couple and the wife of a suburban megachurch pastor. When I mentioned where I was going, there was a split second when my tablemates froze. For those of us who are animal advocates, I think one important part of our job is to get conversations going with people who may not have considered animal issues before and to melt their hearts and minds. So, over fruit and oatmeal, I dove into what was sometimes a challenging conversation. It’s true that people who eat animals will likely be uncomfortable and search their consciences at the mention of either veganism or animal rights. However, an animal rights position can give us more room to connect with those who are different, and it can provide an important framework for the broad change that is needed. 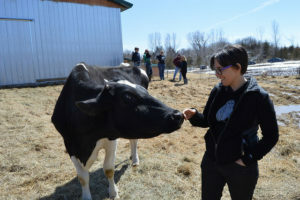 First, let’s talk about the way an animal rights framework, especially one that focuses on reducing suffering, allows us to connect with others. Check out the work of Matt Ball, who in this video explains the advantages of talking about suffering in advocating for animals. He also refers to studies showing that those who move toward veganism in gradual steps are more likely to stick with it. It’s clearly useful to show that we can be vegan, healthy, and happy. It’s vital that we share our stories of connection to individual farmed animals, as Julie Knopp recently did in her Star Tribune piece about Wally the pig. It’s also important that we help people to understand the horrors that farmed animals endure, as we just did through outreach at Twin Cities Pride. Eating together is an important human activity, and a vegan identity gives us a way to build community with others around both shared food and shared values. To attract people to a vegan lifestyle, it’s important to demonstrate its many appealing aspects and to keep our value statements positive. We can scare people off if we create a community that feels judgemental or puts down non-vegans. When we invite people to move in our direction with a welcoming attitude, rather than policing them, we create a nurturing community. Social science research also supports a “gradual move toward veganism” approach as the most effective for farmed animals. The limitation of advocating veganism is the tendency to focus on personal choices. It’s very important to talk about the way our personal choices collectively make a difference, but we can’t stop there. If we look only at personal choices, we miss the opportunity to see what we have in common with those who still eat animals and to look at systems that harm all of us. 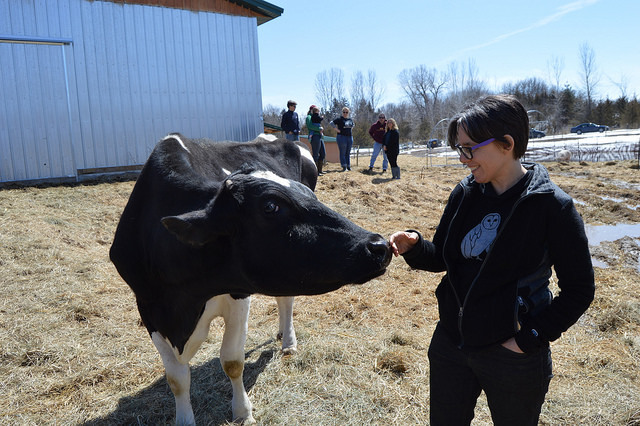 Being able to talk about animal suffering to non-vegans, and to eventually build alliances around common interests, may become the difference in whether or not we can truly make lasting change for the animals. Her last question about building a better food system is a vital one for those of us who care about animals to consider. I believe we can build a food system that gives more space to wildlife, helps turn back the climate change that is destroying life on our planet, benefits both rural and urban communities, and provides all people with good food. Some of our breakfast conversation was uncomfortable. I wrestled with my feelings about their farming. I am clear that I don’t want to see animals farmed or killed, but I am also clear that the industrialization of agriculture is creating problems that negatively affect us all. I hope we can too. We owe it to the animals, non-human and human.